After our 2nd monthly meeting, FBLA members stayed to enjoy refreshments and work on the Georgia FBLA state project <LESS IS MORE>. Students worked on creating handmade posters as well as digitally designed posters to promote <LESS IS MORE> in the area of recycling. Students also made plans to help out with the existing recycling programs going on at Bleckley County High School. The Heart Walk is the American Heart Association’s premiere event for raising funds to save lives from this country’s No. 1 and No. 5 killers – heart disease and stroke. Designed to promote physical activity and heart-healthy living, the Heart Walk creates an environment that’s fun and rewarding for the entire family. On September 26, for the 11th year in a row, Northview FBLA attended the 28th Annual Atlanta Heart Walk in Centennial Olympic Park. Twelve FBLA members, along with officers Raahul A., Miguel B., and Kenny Z., attended walked with a large Northview High School group, which included Northview HOSA, Kaleidoscope, and BETA. Bracing against the cold rain, Northview FBLA helped to raise money and awareness, promote American Heart Association, and build healthier lives, free of cardiovascular diseases and stroke. 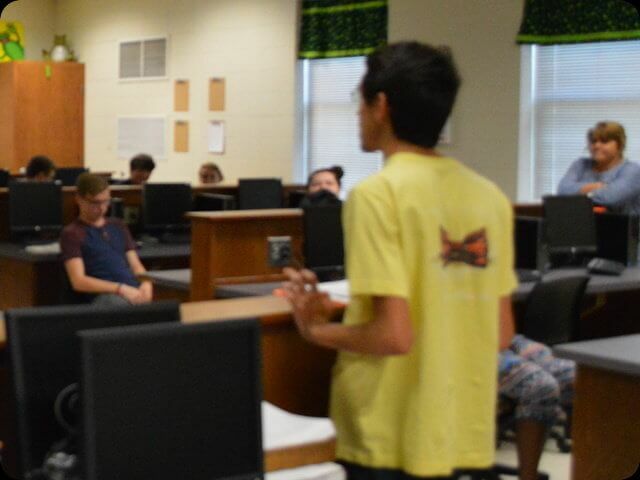 Northview High School’s FBLA chapter recently hosted an informational meeting regarding competitive events. By competing in various categories related to the business field, speaking, and technology, FBLA members can develop their skills in becoming future business leaders. Club officers elaborated on club information, different types of competitive events, Business Achievement Awards, upcoming field trips, and Leadership Conferences. In September, the Northview High School FBLA chapter inducted its newest officers and discussed the events and meetings for the upcoming year. The officers include: state president Kenny Z., region officer Raahul A., chapter president Vishakha H., vice presidents Samuel C., Anoop G., and Macy M., secretaries Miguel B. and Sally P., and treasurer Jun K.. The officer team met afterschool with its advisers over a dinner meeting to catch the new officers up with current plans and leadership tactics as well as to plan the club’s activities for the new school year. Twelve members of Northview High School’s FBLA chapter joined more than 8,500 of America’s high school students at the 2016 FBLA National Leadership Conference in Chicago on June 29 to July 2. They showcased their talents as future business leaders in various competitive events and contended for the opportunity to win more than $175,000 in cash awards. Participants from across the United States attended this conference to enhance their business skills, expand their networks, and participate in more than 55 business and business-related competitive events. There were over 300 competitors with over 70 winners from Georgia. Kyongyun C. placed first in Introduction to Business, Samuel C. placed third in Healthcare Administration, Aditya P. placed fifth in Desktop Application Programming, Ankita S. placed fifth in Impromptu Speaking, and Anuj B. placed sixth Desktop Application Programming. Congratulations to all competitors! Northview FBLA is looking forward to the upcoming 2016 NLC in Atlanta!